Food plays a profound role in our individual lives, especially in terms of our health. It also plays a role in the future security of our planet, and all the creatures inhabiting it. It has now becoming widely known that adopting a plant-based (vegan) diet can positively impact the health and lives of all the world’s living creatures. So how do we do it? How do you go from the typical Western diet of burgers, fries, pizza, and backyard barbecue fare to a diet of delicious, colorful, health-promoting plant foods? Maybe you find yourself in this position. Maybe you’re ready for change. You’ve mentally determined that you are ready to make this change, but now what? Where do you turn for answers? It’s Easy to Start Eating Vegan! Yummy Plants 101 is just what you’re looking for if this is you. The book, authored by Rebecca Gilbert, is a beginner’s guide to adopting a vegan diet. Rebecca has taken what seems to be the ‘mental mountain’ of “I just don’t think I can make the sweeping changes to becoming a vegan” and made it easy for readers of Yummy Plants 101. This chapter introduces you to a vegan diet and contains a nice overview of the topic of protein in the diet since this is on the minds of many making this switch. It also offers fabulous tips on how to make your own homemade nut milks (almond, cashew, brazil, and so forth), as well as offering advice on finding egg substitutes. Chapter two provides you with exactly what it says… various ways to keep your kitchen stocked with the essentials, both perishable and non-perishable items commonly used in everyday vegan living. This chapter was my favorite! It offered a great overview of whole grains and seeds you can use as a base to many of your meals. From brown rice to oats to many other grains you may have yet to hear of like millet, quinoa, and amaranth, Rebecca does a wonderful job explaining the uniqueness of each grain or seed. Many of us in today’s culture love to eat out or attend social gatherings centered on food. Rebecca provides some useful tips on how to do this while keeping you on track with your new lifestyle. There are a lot of questions when making changes to a plant-based diet. This chapter offers resources to help you make the transition. Connect to like-minded individuals at the Yummy Plants online community forum or find important health tips from physicians using food as medicine (Neal Barnard, MD and Joel Fuhrman, MD). This chapter will load you up with meal plan and recipe ideas to start you off on your journey towards plant-based living. Everything from breakfast, lunch, and dinner are covered with a variety of vegan foods to quench your taste buds. All are savory and delicious so you won’t be missing out like you thought you might be. This chapter is a nice guide for those transitioning to a plant-based diet based on whole foods. As mentioned before, the goal is ultimately to help people center their overall diet on vegetables, fruits, legumes, and whole grains. These foods give you the best chance at achieving optimal health. How to Get Your Copy of It's Easy to Start Eating Vegan! It’s Easy to Start Eating Vegan! is a wonderful tool for newbies to the vegan lifestyle. No longer should you fear what a plant-based diet has to offer. Your health and the health of the planet will reap the rewards for years to come if you choose to make this leap of faith. 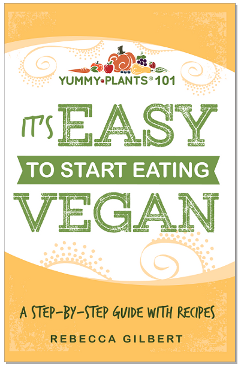 To order your copy of It’s Easy to Start Eating Vegan! visit Rebecca’s website here. You can also purchase on Amazon. Good post. Yes going vegan is easy. Dr John Mc Dougall makes it easiest. Very simple in concept, not much to memorize. Can't get much simpler than this! LOVE this versus the Dr Oz show--he gives endless details and demonstrations.